Alpha and Omega Semiconductor has expanded its fifth generation EZBuck family, with the AOZ6662DI-01 and AOZ6663DI-01 buck regulators. The two high efficiency, simple-to-use synchronous buck regulators are available in a thermally enhanced DFN3x3 exposed pad package. The AOZ6662DI-01 and AOZ6663DI-01 deliver an output current of 2.0 and 3.0A, respectively. 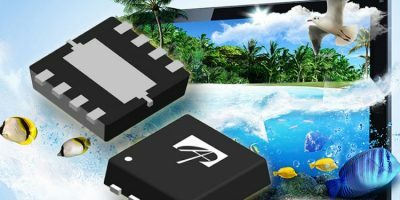 The synchronous buck regulators offer a low on-resistant power stage, allowing cooler power conversion for consumer electronics application such as LCD TVs, set-top boxes, as well as DVD players and recorders. The low on-resistance of the internal power MOSFETs in these devices allows higher efficiency and less heat generation, explains Alpha and Omega Semiconductor. They have over 90 per cent efficiency at full load operation and maintain at 87 per cent efficiency while in 10mA light load operation. When operating in low output current conditions, the regulators will run in a proprietary pulse energy mode (PEM) to obtain high efficiency. Under heavy load steady-state conditions, the device will operate in a fixed frequency and continuous conduction mode (CCM). According to the company, the small standby current combined with a thermally enhanced package achieves better efficiency and thermal performance than was achieved with the previous generation of synchronous regulators from Alpha and Omega as well as from the leading competitor. The regulators are particularly suitable for design engineers who are looking for DC/DC converters that offer high light load efficiency at specific voltage ranges, and allow them to meet these design challenges with adaptable light load capability, says the company. The AOZ6662DI-01 and the AOZ6663DI-01 are immediately available in production quantities with a lead-time of 12 weeks. Alpha and Omega Semiconductor is a designer, developer and supplier of a broad range of power semiconductors, including a wide portfolio of power MOSFET, IGBT, IPM, HVIC, power IC and digital power products. The company integrates its discrete and IC semiconductor process technology, product design, and advanced packaging expertise to develop high performance power management devices.